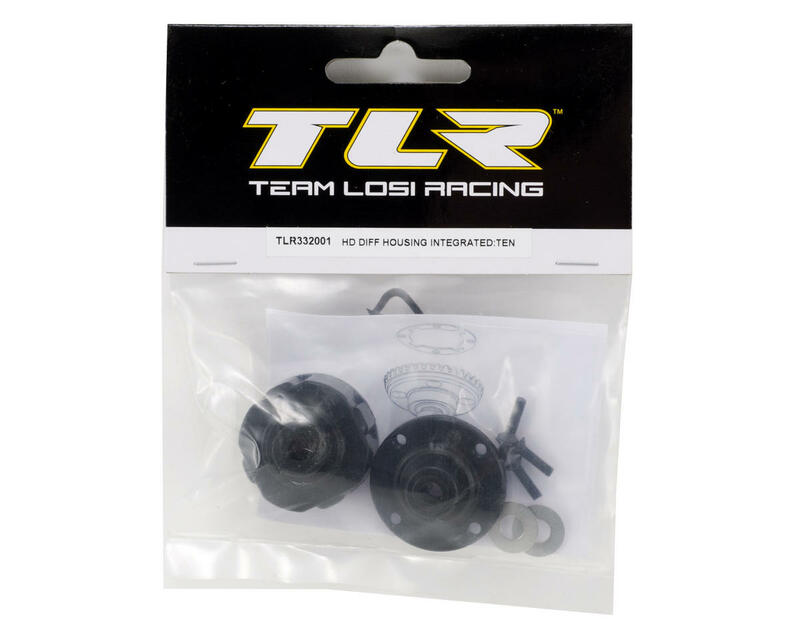 This is an optional Team Losi Racing HD (Heavy Duty) Differential Housing, with an Integrated Insert, and is intended for use with the Team Losi Racing TEN-SCTE 1/10 scale 4WD short course truck. 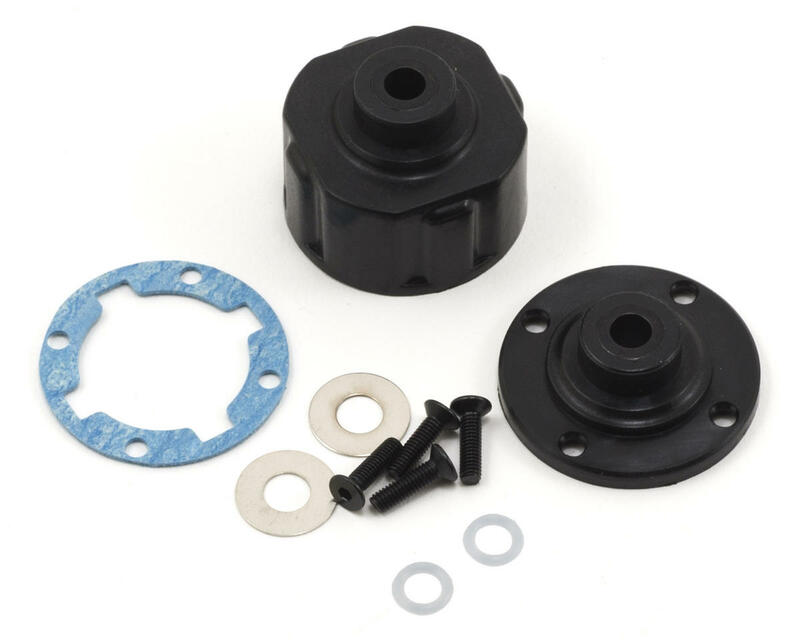 This package includes one complete differential housing, one gasket, two shims, two o-rings and hardware. This differential housing can be used in the front or rear differential. The new HD diffs are an improvement over the original ones. But to make it a huge improvement I had to swap out a few of the stock parts included in this set. I haven't had a drop of diff fluid leak on me since. The key is to build it correctly and use a few aftermarket parts to bullet proof the diff. The design is good but there are a few week parts in this diff rebuild set. The diff screws are very soft and easy to strip I highly recommend that you swap it out with some Protek screws 2.5x12mm (PTK-H-2104). The other weak part is the diff shims. I rebuilt the original HD set and noticed that the shims had bowed out into a bowl from wear and tear. The shims are too flimsy. I swapped the shims and bushings out with the stronger ones from APE-rc. The next thing you are going to need is AE green slime (ASC1105). Thats it. Do it right onces and you won't have to touch it for a while. Another note while building up the diffs is to make sure you don't overfill the diffs. Use the green slime on the o-rings and the gasket. When screwing in the diff cap make sure you watch for any seepage which could be caused by overfilling. If you see any sign of diff fluid after you finish screwing in the screws then you overfilled it and lossed the seal that that green slime provides. Rebuild it so that you don't see any diff fluid. Some green slime seepage is ok but if any diff fluid shows up then you didn't build it correctly and that diff WILL leak. If done correctly your diffs will stay filled for a very very long time. I bought this to replace the original. The screw in to the bag are very poor and strip realy esily. When I tried to screw it, it takes me a lot of strenght, because they juste make an hole in the plastic case... Theres no threads in there!?!?! and when came the time to unscrew it i break a screw in two parts. So now I have a lot of problems to pull the screw out of that part... it breaks just at the tips of the case. I got an ARR Losi Ten-SCTE and the first thing that I did when I received it was toss the stock diff housings. I read too many complaints about how poorly the stock diffs seal resulting in grease or fluid loss. These HD housings are much better than the stock ones. My biggest complaint is that the included screws are VERY easy to strip out even with high quality tools. I did some searching and Chris Attebery from APE-RC used some M2.5 x .45 x 10 mm from McMaster-Carr. They come in a box of 25 screws. Otherwise, you'll have to buy the entire diff housing assembly to get replacement screws. After 4 months of HARD use, I just started seeing some seepage from the rear diff.